В каких случаях будет появляться такое сообщение? of bookmark files is unlimited. The message above is only in combination with the browser integration. only display the first 80 bookmarks, then this message is displayed. Кто-нибудь сталкивался с таким? Где копать? Появилось только недавно, в течение полутора месяцев всё работало "на ура"
Page not available?. Кто поможет с настройками. Стоит ZoneAlarm Pro. Прокси не ставил. 1. можно ли с помощью него собирать АРХИВ сайта? 1. Если я правильно понял, то в настройках закладки на вкладке "действия" поработай с пунктом "добавить в архив"
2. в настройках закладки на вкладке "дополнительно" - пункт"избражения"
Рад был помочь. Я, наоборот, режим Beginner Mode заметил токо тогда, когда более-менее нормально разобрался в проге. Как-то сразу и не подумал, что он у тебя включен. а по русски я их не могу посмотреть для лучшей ориентации?? 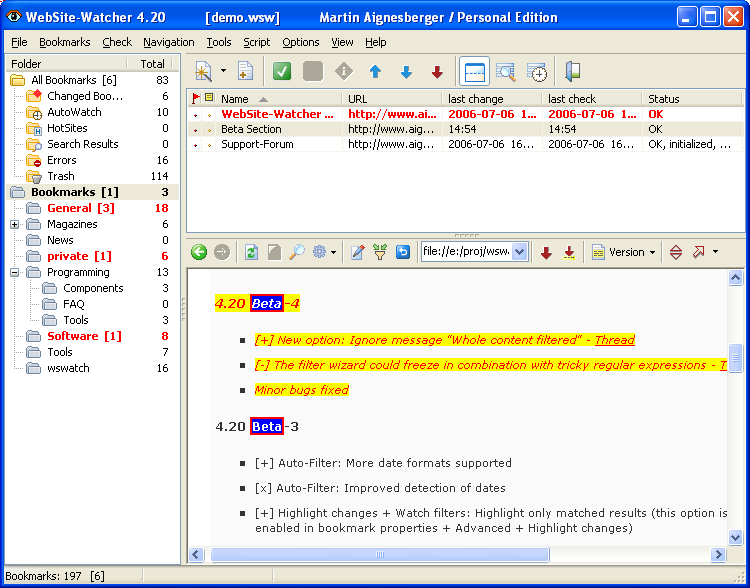 WebSite-Watcher 3.60 beta 1 21.08.2003. [+] RSS support (many websites offer new content as RSS newsfeeds, an example URL is http://slashdot.org/index.rss). WebSite-Watcher transforms RSS files into a readable format. [x] Bookmark properties / AutoWatch: Settings are now check every seconds/minutes/hours. "check every x times" is no longer available and the global countdown value in the general options is no longer needed. [+] If a server sends the file size, the downloaded page is compared with this size. If not equal, Website-Watcher tries to download the site a second time. This will reduce false alerts of truncated downloads. [+] If a file download was running and WebSite-Watcher was closed, then the download was aborted. Now WebSite-Watcher asks if you want to close the program when a download is active. [+] Internal preview: Open links in your default browser instead of Internet Explorer (if IE is not your standard browser). This feature is disabled by default and can be enabled in the options menu of the internal preview. [+] The internal preview can now block annoying popups (a small side effect: you cannot open a link in a new window via the context menu until the site is completely loaded, but Shift+Click on a link works always). This feature is disabled by default and can be enabled in the options menu of the internal preview. [+] new wswatch.ini / [Troubleshooting] setting: DownloadSleepValue = nnn (this options slows down the transfer speed, the default value is 1, to slow down the connection you can use for example 100. Only use this setting when WebSite-Watcher eats all your bandwidth and blocks other online tools). [x] Dialup: The RAS-dll is only loaded when it is really needed. If you have a permanent internet connection WSW doesn't try to load this dll. The wswatch.ini setting UseRas=0 is no longer needed if you had problems with this dll. [-] date variables in URLs and PostData: month names were always converted to lowercase, they are now used as defined. Особенно приятно, что WebSite Watcher теперь понимает RSS. Сообщения об ошибках и неточностях приветствуются - читайте readme-файл. WebSite-Watcher 3.60 beta 5 22.09.2003. [x] Internal browser / Open links in new window with default browser: due to some side effects with this feature (introduced in Beta-1) only Shift+Click can open a link with the default browser. If you use the context menu, then links are opened again in Internet Explorer .